If you've been reading Football Outsiders the last couple weeks, you know the drill on this one. Super Bowl XLIX is a close matchup if you look at our standard regular-season DVOA, where the Seattle Seahawks finished No. 1 and the New England Patriots No. 4. But it's really, really close if you use our weighted DVOA ratings that include playoff performance and gradually lower the weight of games from more than two months ago. In fact, it might be the closest Super Bowl matchup ever. ... but again, it's only the closest Super Bowl matchup ever if you don't consider the first few weeks of the season. This gets to what has been a running theme this year: just how much data is appropriate to judge a team, and is it really more accurate to judge a team without including its early-season games? We've written about how surprisingly, total regular-season DVOA tends to predict playoff performance better than weighted (although also regular-season only) DVOA. At the same time, you don't want to allow tiny differences in correlations to overwhelm common sense. There's no doubt that the New England Patriots and Seattle Seahawks are better teams now than they were in September and early October. It's not a question of just looking at the records, where the Patriots began 2-2 and the Seahawks 3-3. There are major personnel changes that help to explain the statistical improvement in the second half of the year, in particular players who either returned from injury/suspension (Jeremy Lane, Brandon Browner) or played through early injury and then improved as they got healthier (Rob Gronkowski, Bobby Wagner, Kam Chancellor). The Seahawks offense improved when they stopped desperately trying to run the entire scheme around Percy Harvin. The Patriots offense improved when they finally installed rookie Bryan Stork at center, then again when they picked up LeGarrette Blount off waivers from the Pittsburgh Steelers. Analysis of the stat matchups in this game is made more confusing by the way those stats changed dramatically over the course of the year as the two teams improved -- or, in a handful of areas declined. The running theme of this preview is to ask "which Seahawks team are we looking at, and which Patriots team are we really looking at?" For those who may be unfamiliar with the Football Outsiders stats, they are explained at the bottom of the page. Scroll down or click this link. Please remember that all stats represent regular season only, except for weighted DVOA and anything else specifically noted. All game charting for these two teams is now complete; any game charting data that appears with a asterisk appears courtesy of the ESPN Stats & Information Group. This preview has two different week-to-week charts for each team, one for offense and one for defense. Because defensive DVOA is opposite of offensive DVOA, the defensive charts are flipped upside-down; thus, the higher dots still represent better games. You also might want to read the rest of our Super Bowl XLIX content from over the last couple weeks. I looked at Seattle and New England ranking among the league leaders in penalties, and the strangely low total of penalties called against Seattle opponents. Cian Fahey broke down how the Seahawks might cover Rob Gronkowski and what the Patriots' linebackers mean to this game. Scott Kacsmar looked at Russell Wilson's mobility and how often he improvises by charting every play of his NFL career. Vince Verhei looked at the common threads between New England's losses as well as Seattle's losses. J.J. Cooper looked at the two offensive lines and their trends in sack prevention this season. Scramble for the Ball had its annual Prop Bet Extravaganza. *In keeping with the theme of these two teams transforming after the early weeks of the season, this is no longer an issue for the Seahawks, as explained further here. Seattle is one of the few NFL offenses still based around the ground game despite the pass-heavy environment of the modern NFL. The Seahawks run more than almost any other team, and they do it with remarkable efficiency that mixes steady gains with huge game-breaking highlight runs. Seattle's run offense DVOA, which incorporates both runs by the running backs and by quarterback Russell Wilson, was the fifth highest of any team since 1989. A quick look at New England's season-long stats suggests that the Seahawks won't find it too tough to run on the Patriots. They've been an average run defense over the course of the entire season... but this is the first of many places where one of these teams has changed dramatically since the early part of the season. From their Week 10 bye until the end of the regular season, the Patriots had the best run defense in the league according to DVOA. There's no clear change that seems to explain such a strong turnaround. It's not really an issue of linebackers, as both Jamie Collins and Donta Hightower were playing plenty even before Jerod Mayo went out for the season in Week 6. The Pats added defensive tackle Alan Branch in Week 11, but he didn't play 40 percent of the snaps in a game until Week 16. Another rotation tackle, Sealver Siliga, returned from the IR-designated list, but not until Week 14. Shaded cells are stats that include all runs, while the other stats are for running backs and Wildcat plays only. The improved run defense disappeared in the two playoff games, although that's obviously a small sample size. The Patriots allowed a combined 4.79 yards per carry and 13.7% DVOA to the Baltimore and Indianapolis running backs. The Patriots don't allow a lot of long runs (No. 3 in the league, allowing just 0.47 Open Field Yards per carry) but they don't force a lot of short runs either. They stuff opposing running backs on just 15.7 percent of runs (28th in the NFL) while Seattle running backs are stuffed for a loss or no gain on just 17.5 percent of runs (sixth among offenses). The numbers look even worse for the Patriots in those must-convert situations. Seattle converted 81 percent of short-yardage runs, tied for the league lead, while the Patriots allowed conversions on 81 percent of these runs, the worst of any defense in the league. Like all the Pats' run defense numbers, these stats got better in the second half fo the season. The stuff percentage is particularly improved after Week 11, but the ability to stop opponents in short-yardage situations was still a problem. Another issue is that the Seahawks run best where the Patriots' run defense is at its worst. Our ALY numbers show the Pats as strongest against runs on the left and weakest against runs up the middle or to the right. And the Seahawks running backs are strongest when running to the right, and weaker when running to the left, though they are better running "left end" than "left tackle." There's also the type of run we're talking about here. According to ESPN Stats & Information data, the Patriots faced 38 read option plays this year, exactly the NFL average, and did allow a less-than-average 4.18 yards per carry. Cian Fahey talked about it a bit in his piece on the Patriots' linebackers last week, but 33 of those 38 plays came against two teams, the Dolphins and Jets. The Dolphins only ran one zone read in Week 1, so we're really just talking three games, plus a handful of plays by the Raiders and Bengals. There was a blown handoff by the Jets charged to Geno Smith, but only two of the other 37 plays were quarterback keepers, Ryan Tannehill runs for 15 and 6 yards in Week 15. That's 5.4 percent of the zone reads against the Pats. By comparison, Russell Wilson kept the ball on 18.8 percent of Seattle zone reads this season, not counting blown handoffs. So the Patriots' defense against the Jets and Dolphins doesn't tell us what they'll do against a better running back and a quarterback more likely to keep the ball. Connected to the read option, in part, is the play-action game. The Seahawks used play-action on 31 percent of pass plays this year, second in the NFL, and many of those fakes were built to look like zone reads (or were actually zone reads where Wilson kept and threw instead of handing off). 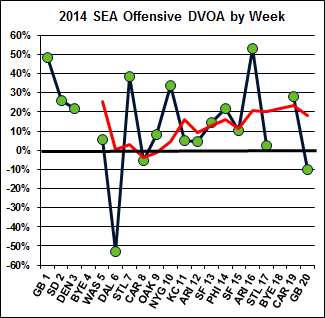 Seattle actually got a below-average benefit from play-action, with average yards going from 6.6 without to 7.4. That's an 0.8-yard advantage, compared to the NFL average of 1.3 yards. The Patriots faced very little play-action -- 17.7 percent of passes, 30th in the NFL -- and were average against it, allowing 7.4 yards per pass with play-action and 6.0 yards per pass without. 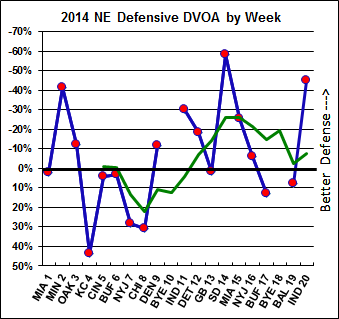 New England's pass defense improved at the same time the run defense did, from 10.2% DVOA in Weeks 1-9 to -8.1% DVOA after the Week 10 bye. Pass defense around the entire league improved significantly in the second half of this season, so that only took the Patriots from ranking 16th in pass defense in the first half of the year to 11th in the second half. However, there is a clear personnel change here that led to the improvement in the pass defense: the activation of Brandon Browner after an early-season suspension and a couple of games missed due to an ankle injury. More importantly, activating Browner meant the Patriots didn't need to depend on undrafted rookie Malcolm Butler or the suddenly, inexplicably terrible Alfonzo Dennard. Darrelle Revis led the Patriots in targets mostly because Browner only played nine games, but make no mistake, he's not Revis Island anymore. He's just Revis, Very Good Cornerback. Opponents were perfectly find throwing at Revis a few times per game. His coverage stats are similar to those for Richard Sherman, with a slightly higher Success Rate but more yards allowed per pass. As you might expect, Revis moves around the field more than almost any cornerback in the league. We have him charted with 28 targets on the left side, 30 on the right. Some thought that the Patriots might revert to cornerbacks-by-sides once Browner was healthy since he had been used to always playing on one side in Seattle, but he moved around too, with 26 targets charted on the left and 18 on the right. Revis generally does cover the opponent's No. 1 receiver and I suppose that means Doug Baldwin in this game, with safety help likely rolling towards Browner covering Jermaine Kearse. Kyle Arrington is the preferred slot corner. Ryan is the utility guy, who covered for Browner early in the season, covered for Arrington late in the year, and came in when the Pats went to a four-corner, one-safety "penny" set like they did against the Colts in the AFC Championship. Butler is primarily a special teams player who will only play defense if there's an injury; Dennard lost his job early in the season and has only two charted targets after Week 7. Seattle's passing game improved after the early part of the season, just like the New England pass defense, and again a specific personnel change is clearly part of the improvement. After Week 6, the Seahawks weren't trying to build their entire offense around 2-yard passes to Percy Harvin, and they went from 10.4% passing DVOA and 6.12 net yards per pass before the trade of Harvin to 23.8% DVOA and 6.71 net yards per pass afterwards. Harvin actually had the worst DVOA of any of the Seattle wide receivers this season. The wide receivers are not the strongest part of the Seattle offense. Doug Baldwin is very good, as noted in this piece about catch radius before the season, but he still had just 5.4% receiving DVOA. The other starting receiver, Jermaine Kearse, was just 61st in DVOA among wideouts with at least 50 passes. Paul Richardson, the only other receiver with more than 15 targets, is out with a torn ACL. Making up for that weakness are the running backs, who are very good as receivers, as well as tight end Luke Willson, a 2013 fifth-round pick who has broken out big in the second half of the season. Since Week 10, including the postseason, Willson has 47.6% DVOA, catching 20 of 29 targets for 362 yards and three touchdowns. Willson could have a huge game because the Patriots have had major problems covering tight ends all season, ranking 30th in the NFL. Their DVOA against tight ends improved slightly in the second half of the year, but was still poor at 13.4%, and they actually allowed a higher catch rate to opposing tight ends after Week 10 (68 percent, as opposed to 63 percent before Week 10). The Patriots are likely to use either Collins or Hightower as a spy to try to prevent Wilson scrambles, just as they did against Andrew Luck in the AFC Championship Game. They are not likely to blitz very much to try to pressure Wilson. Wilson is very good against the blitz, going from 6.7 yards per play with three or four pass rushers to 7.7 yards per play with five or more. * Meanwhile, Jacksonville was the only defense in the league to send five or more pass rushers less often than the Patriots, who blitzed 20.7 percent of pass plays. The Pats actually allowed more yards per pass blitzing (6.6) than not blitzing (6.3) and they were particularly gruesome on the rare occasion that they sent a defensive back blitz (only 5.8 percent of pass plays, but they allowed an average of 9.7 yards on those 34 plays). One more stat I couldn't fit in elsewhere above: We've written a few times about the Seahawks' tendency to start games slow and then improve in the second half. They rank 13th on offense and seventh on defense before halftime, then lead the league in both offensive and defensive DVOA after halftime. 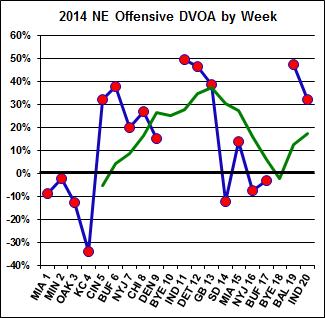 The offense, at least, has to tangle with a Patriots defense that shows the same trend. In fact, New England's trend is more specific. The Patriots this year ranked just 30th with 11.8% defensive DVOA in the first quarter of games. Only Tampa Bay and Oakland were worse defenses for the first 15 minutes. After the first quarter, the Patriots had -8.4% DVOA, making them the league's No. 7 ranked defense from the second quarter on. You may remember that our preview of the AFC Divisional matchup between Baltimore and New England pointed out that Joe Flacco seems to have his best games against the league's worst pass defenses, even after adjusting for quality of opponent. Kenneth Arthur pointed out this week in a piece over on FieldGulls.com that the opposite seems to be true for Tom Brady, at least this season. For the most part, Brady had his best games this year against the best pass defenses on the schedule. His best game by DVOA came against Chicago, ranked 29th in pass defense, but he also clobbered Buffalo (No. 1) and Cincinnati (No. 7). Not counting the Week 17 game against Buffalo, where he played only one half with a number of other starters sitting on the bench, Brady's bottom four games in unadjusted VOA all came against pass defenses ranked between No. 13 and No. 25. This trend doesn't stick out quite as much with a larger sample, but yes, Brady really does seem to play best against his best opponents -- and his worst opponents. I took every game from the last three seasons, including the playoffs, and broke them down into four categories based on the final regular-season pass defense DVOA rank of the opponent. The numbers for the "Pass Ds 9-16" category actually go down with Gronk active because that includes the two worst games from early this season when Gronk wasn't yet fully healthy, against Miami and Kansas City. The "Pass Ds 1-8" category includes the Week 6 game from 2012 where Brady had 12.3% passing DVOA (which was -5.8% VOA before adjustment) against Seattle. And yes, there's a little bit of arbitary endpoint-picking going on here but I tried to make a big scatter plot and it just looked messy. So I went with the table.